Our uPVC French doors offer unparalleled elegance and functionality to your home. Select Products has over 20 years of experience within the double glazing industry having installed many uPVC French doors throughout Leeds, Bradford, Harrogate, Wetherby, Horsforth, Pudsey, Otley, Ilkley and Yeadon. Our reliable team of fitters are highly qualified to ensure that your property will be in safe and professional hands. 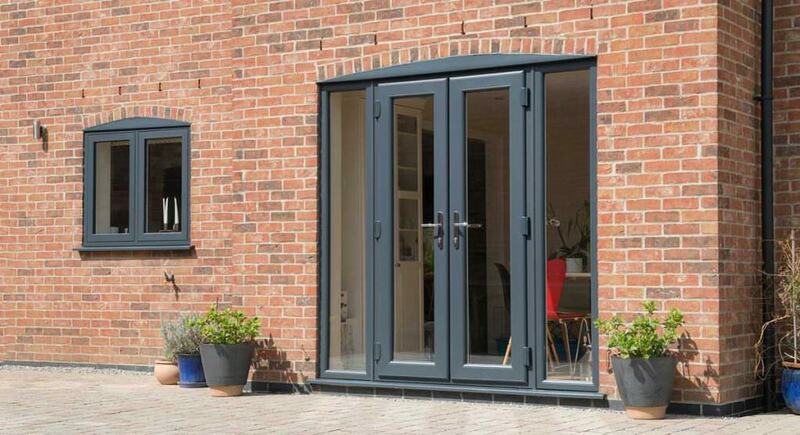 Our stylish range of French doors are as functional as they are attractive, and they can provide any home with the ultimate combination of thermal efficiency, security and resilience. Available in a breath-taking range of colours and finishes, we are confident that you will find the perfect French doors to complement your home and to effortlessly blend into your existing house and garden décor. We employ an industry-leading and sophisticated internal design to ensure that all of our uPVC products perform to the standard that customers have come to expect. 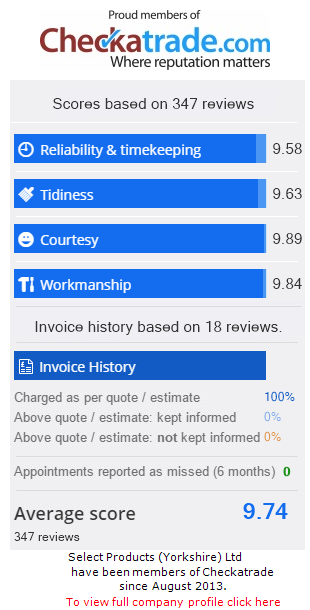 This, combined with our extraordinary workmanship and attention to detail, has resulted in a vast number of satisfied customers, many of which have left glowing reviews on Checkatrade. Here at Select Products, our customers are our number one priority. We strive to leave every customer happy, and our dedication to our clients sets us apart from the competition. Our commitment to you is that your home improvement will be constructed to the highest caliber and installed by an experienced team of fitters that are experts in their field. We ensure to fit your French doors as quickly and efficiently as possible, creating minimal disruption to your busy life. Perfectly match your stylish uPVC French doors to the ambience of your home with our extensive colour and finish selection. Available in a premium range of solid colours and three woodgrain finishes, it has never been easier to find the ideal doors to take your home to the next level. You can customize your French doors even further by matching them with our top of the range hardware and handles, available in an equally impressive assortment of shapes and shades. 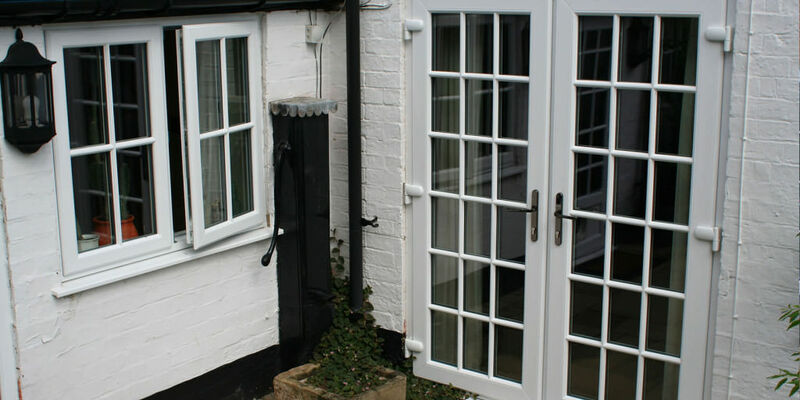 Installing your French doors with us allows you to entirely revamp the feel of your home and garden in minutes. You can have complete peace of mind knowing that your family will remain protected with our highly secure double glazed doors. All of our French doors come with a choice of high security Yale multi-locking systems, helping to keep your property safe and defended from any would-be intruders. Furthermore, all of our doors are accredited by Secured by Design in order to give you optimal protection. 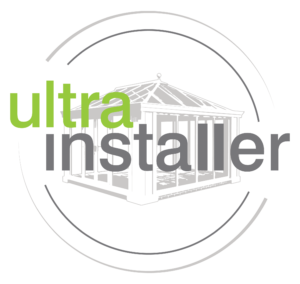 We are so confident in the quality of our products that we supply every installation with an extensive 10 year manufacturer-backed guarantee as standard, so you can rest easy knowing that you are completely covered at all times. Here at Select Products, our doors are built to last. You will be sure to enjoy the universally flattering style of our French doors for years to come, and our classic designs are created to never go out of fashion. We strive to develop products that stand the test of time and that is why we make our uPVC French doors using only the highest grade premium materials. Our uPVC French doors are guaranteed not to warp, twist or rot from prolonged exposure to the elements, allowing them to remain as stunning as they were the day they were installed throughout their impressive life-span. Maintenance is kept to a minimum, meaning the occasional clean is all that is required to keep your door’s dazzling ‘as new’ appearance. All of our uPVC French doors are able to be optionally fitted with restrictors that prevent them opening out past a set distance. This reduces the risk of damage to your doors that can come as a result of powerful winds or forceful opening, saving you expensive trips to get their inner glass replaced if your French doors get caught by a particularly strong gust of air. All of our uPVC windows and doors employ a unique and state of the art inner structural arrangement that not only increases the frame’s inherent rigidity, but also works to trap pockets of warm air. This intelligent design has enabled our uPVC French doors to receive an A grade in their thermal efficiency rating. A properly insulated house is the key to maintaining a comfortable living environment and keeping your home warmer for longer during the colder winter months. Increasing your property’s thermal efficiency can have some brilliant benefits for you as a home owner, and could result in decreased heating bills and an overall lower carbon footprint for your residence. High Security: Fitted with high performance Yale locks as standard. Environmentally Friendly: Eco-friendly for higher energy saving and lower carbon emissions. Durable and Resilient: Manufactured using high-grade uPVC materials for an exceptional lifespan. Thermally Efficient: Exceptional heat retention properties. If you think our classic uPVC French doors could be a great choice for your home then you can generate your free, no obligation quotation in seconds courtesy of our easy to use online quote builder. Just choose from our wide collection of attractive uPVC French doors, available in a variety of styles and finishes, enter your door measurements, and get an online price for your favourite designs instantly. Your perfect set of uPVC double glazed doors is only a click away! If you would prefer to speak to one of our in-house home improvement specialists directly then you can alternatively get in touch with us via our online contact form, or call us on: 0113 257 8933. A friendly member of staff will be happy to help you with your enquiry and we will be sure to have you sorted with the perfect set of French doors to complement your home in no time. Select Products are a TrustMark and BFRC registered company, so you know you are in capable hands with us.